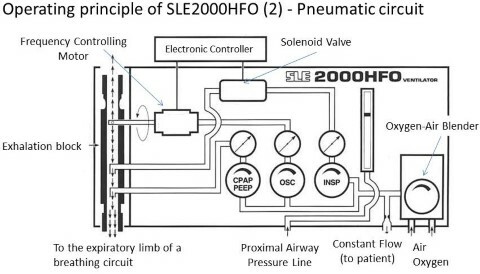 SLE2000HFO is basically a pneumatic ventilator similar to SLE2000, but features the HFO (High Frequency Oscillation) mode. The pressure waveform is shown on a graphic display to enhance users’ convenience. 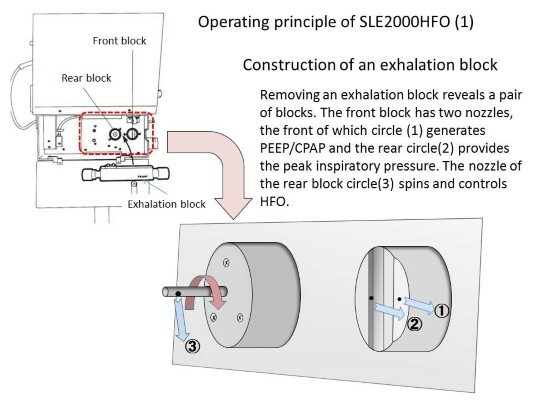 Though lacking the robustness of a piston-type ventilator, SLE2000HFO is a unique system with which a disposable circuit can be used to deliver HFO. The device’s design where leaks are compensated for by a flow from the expiratory limb is well compatible with Kawaguchi nasal CPAP. This feature enables respiratory control without replacing a breathing circuit from the acute stage through to the healing stage. As the specifications match those of SLE2000 listed in the previous article “SLE2000”, the followings are those associated with the HFO mode only. Though the configuration for conventional ventilation of SLE2000HFO is the same as that of SLE2000, pressure alarm settings are indicated graphically for better operability compared to SLE2000. The Frequency Adjustment (RATE) Knob, HFO Mode Selector Switch and Amplitude Adjustment (OSCILLATOR) Knob are added to the original setup for the HFO mode. As in the case of SLE2000, SLE2000HFO is a pneumatic ventilator which delivers a constant flow of 5L/min to a breathing circuit. It has two separate blocks which are connected to an exhalation block. The front block has two nozzles, the front of which (Fig.1-(1)) generates PEEP/CPAP by delivering a back-flow to an expiratory circuit against the constant flow. The oxygen concentration of the back-flow is set at the same oxygen level of the constant flow. 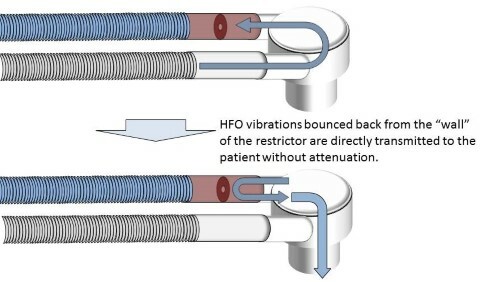 The rear nozzle (Fig.1-(2)) generates the peak inspiratory pressure by delivering a back-flow of a gas supplied through a solenoid valve (electromagnetic valve) (Fig.2) also against the constant flow. The rear block (manifold block) spins and controls HFO. In the spinning jet method, the jet flow delivered from a spinning nozzle to an exhalation block (Fig.1-(3)) creates a sinusoidal wave of both positive and negative pressures. HFO pressure (amplitude or delta pressure (dp), unit: cmH2O) is controlled by Amplitude Adjustment (OSCILATOR) Knob and frequency is set by Frequency Adjustment (RATE) Knob. When superimposing HFO to either the inspiratory or expiratory phase of mandatory breaths during CMV (Intermittent Mandatory Ventilation)+HFO, the delivery of a jet flow of HFO is adjusted. MAP would rise as HFO amplitude is increased using OSCILLATOR (Amplitude Adjustment) Knob. Make sure to reconfigure MAP every time the amplitude is adjusted. In the SLE2000 series ventilators, the back-flow increases as ventilatory settings (PEEP, PIP) are set higher. In conventional modes, the back-flow may reach up to 30-40L/min and in the HFO mode, it may rise to 35L/min when the delta pressure (dp, unit: cmH2O) is highest. As SLE2000HFO consumes a lot of gasses, gas consumption volume should be carefully monitored when the system operates with a gas cylinder (i.e. during transport). Only SLE series ventilators can deliver HFO using disposable breathing circuits. Generally, in the HFO mode, low-compliance, reusable breathing circuits are used because such circuits’ rigid structures prevent variation of circuit volume when pressure changes. In this way, oscillations generated at the expiratory limb will not attenuate or resonate. However, SLE series can uniquely operate with a disposable circuit in the HFO mode thanks to the restrictor connected to Y-piece. Though HFO oscillations do not propagate through a narrow path, oscillations generated by SLE’s exhalation block transmit through an expiratory circuit, hitting the restrictor, bounced back, and directly transmitted to a patient. Hence the attenuation rate is considerably low (Fig.3). This distinctive feature offers great handiness and manageability of a breathing circuit. Even when an inspiratory circuit is disconnected from a restrictor, the restrictor enables the system to temporarily continue ventilation using a back-flow from the expiratory circuit. However, in such a case, the gas delivered by the ventilator is not heated or humidified (dry gas) and triggers an alarm which monitors a flow through the inspiratory circuit. 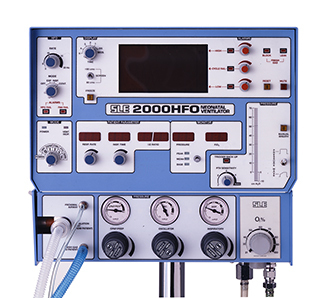 Though SLE2000HFO generates HFO waves by a spinning jet stream, it is categorised as a HFO (High Frequency Oscillation) ventilator not HFJV (High Frequency Jet Ventilator). HFJV provides only positive pressure generated by a jet flow and expiration is achieved passively. Unlike HFJV, however, SLE2000HFO creates negative pressure in a breathing circuit by a reverse jet flow during the expiratory phase and actively supports expiration. Therefore this model is categorised as an HFO ventilator though it also uses a jet flow to generate oscillations. HFO frequency of SLE2000HFO is recommended to be set at 10-12Hz. As shown in the Fig.4, tidal volume of HFO (VTHF) increases in almost direct proportion to dp(cmH2O). When frequency is decreased whilst maintaining the same dp, VTHF increases accordingly and the inclination of VTHF slope to dp becomes steeper. 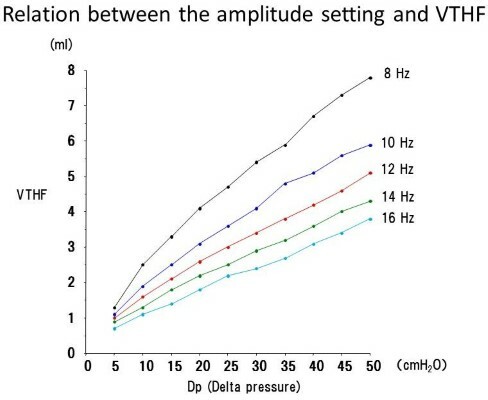 This means that if HFO is provided to an ultra-low birth-weight neonate, VTHF can be finely tuned at the frequency of 12Hz rather than 10Hz as the inclination is less steep. In contrast, in case of a weighty neonate, a larger tidal volume can be delivered at the frequency of 10Hz. Thus frequency should be set depending on the case. Please note that making a significant change to frequency during HFO may cause a major fluctuation of HFO amplitude. As described in “SLE2000″, the 4th article in this series, SLE2000 models provide a constant flow of 5L/min from the inspiratory limb as well as a back-flow from the exhalation block during the inspiratory phase. Also, the back-flow from the exhalation block compensates for any leakage detected. Compared to other makers’ ventilators, SLE2000HFO is highly compatible with Kawaguchi nasal CPAP cannula which is small and extremely well-fitting. Though it is a basic premise of nasal CPAP that a certain leakage always occurs at the mouth, if the mouth is completely shut by using a chin strap, a constant flow from the inspiratory limb goes through the small cannula without any loss. This may cause a gap between the pressure in the nasal cannula and the pressure at the measurement site. This tendency will become more conspicuous when the flow is increased for providing higher CPAP. However, in case of SLE2000 series, a constant flow from the inspiratory limb is permanently fixed at 5L/min and leakage is compensated for by a back-flow delivered from the exhalation block. 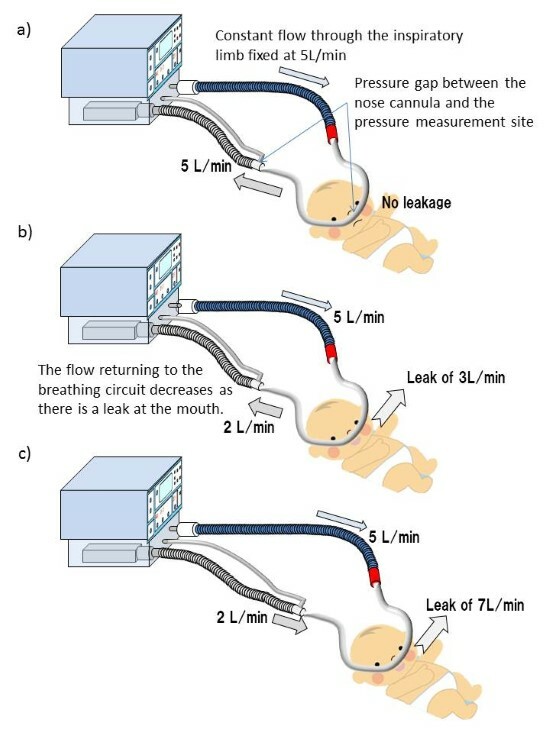 Therefore, according to the test conducted by the manufacturer, the difference of the flow rate between the nasal cannula and the pressure measurement site was found within the range of +/-2.0 L/min (Fig.5-b, c). As such, the pressure gap is considered to be negligible even with a small nasal cannula. 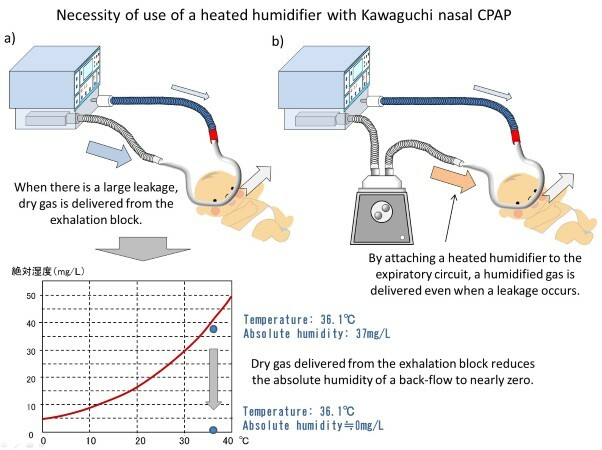 As described previously, when Kawaguchi nasal CPAP is used with SLE2000 series, a leakage at mouth is compensated for by a flow from the exhalation block. In some cases, a reverse flow is constantly provided for a certain period and humidification of the gasses delivered to a patient becomes crucial. As the humidity of gasses supplied from the wall outlets is maintained at almost zero for avoidance of condensation, a back-flow constantly provided from the exhalation block is also dry unless the gas is heated and humidified during the course. When using Kawaguchi method nasal CPAP with SLE2000 ventilators, it is necessary to attach a heated humidifier to the expiratory limb. The heated humidifier can also be used as a water trap.